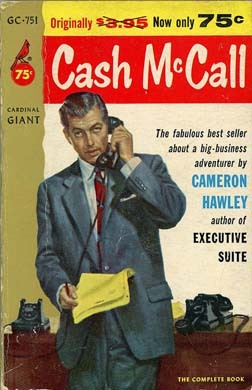 Cash McCall (1955) is a novel by Cameron Hawley that is positive about business and free-market capitalism. It explores many of the same themes as does Ayn Rand’s Atlas Shrugged but it is not nearly as philosophical. Like Atlas Shrugged, Cash McCall is populated with a range of good and bad characters. It is also a 1959 film starring James Garner and Natalie Wood. Despite some changes in the details, the film is very similar to the book. McCall is a notorious financial maverick and mysterious millionaire who buys depressed companies, makes changes to them, and sells them to make profits. He acquires companies in order to sell them rather than to operate them. He adds value by making companies more effective and/or by taking advantage of overlooked opportunities. Cash McCall’s name has become legendary and he has become the subject of much gossip, rumor, and innuendo. Many people call him a pirate and believe that he is an evil, unprincipled, and immoral man. Others are jealous and envious of him. Throughout the novel the reader, as well as characters in the book, discover the true character of McCall, what he represents, and what he stands for. In the novel we meet the weary Grant Austen, who is worn down by the responsibilities of running his company, Suffolk Moulding, a small family-owned plastics company. The only two owners are Grant and his daughter, Lory. Although Grant Austen appears to be in a rut and is not a great businessman, he is not exactly ready to retire. However, he does fear that he is in danger of losing a vital contract. Austen’s largest customer, Andscott Instrument Corporation represents around 60 percent of Suffolk’s business and wants Suffolk to produce a new, larger television cabinet. In order to do so, Suffolk would need to install a new press costing a quarter of a million dollars. General Danvers, Andscott’s President, threatens to take all of his business to another company if Suffolk does not do as he says. Later in the novel we discover that Danvers was bluffing about moving his business elsewhere—he knew he could not because of certain patents that Austen owned. While reading a newspaper, Grant Austen sees an ad that gives him the idea of selling his company. He discusses this idea with his daughter, Lory, and then he tells Gil Clark, a management consultant with Corporate Associates, that he is contemplating selling his business and retiring. During their discussion, Austen does not disclose to Clark the precarious situation that Suffolk is in with Andscott. He wants to create the image that he simply wants to retire. Gil estimates to Austen Clark that two million dollars would be an extraordinary amount to receive for his company. In a later conversation in the novel, Will Atherson, President of Freeholders Bank and Trust Co. of Philadelphia provides Austen with a similar estimate of Suffolk’s value. Atherson, who has worked with McCall, tells Austen that he could be lucky to get that amount. Gil Clark is a young management consultant with integrity who understands the moral and practical value of capitalism, business, and careers in business. He realizes that business can improve human existence through the production of increasingly better products that contribute to the fulfillment of individuals’ lives. In the beginning of the novel Clark does not know that McCall owns the consulting firm that he works for. Harrison Glenn, Gil’s boss and President of Corporate Associates, suggests Cash McCall to Gil as a potential buyer of Suffolk and arranges for Gil to meet with McCall over lunch. In the beginning of the story Gil is skeptical and has a negative impression of Cash based on hearsay. He thinks that McCall is a person who would not hesitate to throw an entire community out of work if it meant making a quick profit. This attitude soon changes to approval when he meets with McCall and sees him in action. When Gil meets Cash he finds him to be a moral businessman and a true gentleman who treats all parties in a business deal with justice and fairness. Cash inform Gil that he is the owner of Corporate Associates. Impressed with Gil’s character and business, Cash offers him a job as his assistant. Gil explains to Cash that he has no objection to making money. In response, McCall proclaims his agreement with this view: “In case there is any doubt in your mind, Gil, I don’t belong to the better circles. I’m a thoroughly vulgar character—I enjoy making money.” (153). “We have a peculiar national attitude toward money-making… We maintain that the very foundation of our way of life is what we call free enterprise–the profit system. We’re so serious about it that we’ll fight to preserve it – literally go to war – but when one of our citizens shows enough free enterprise to pile up a little of that profit, we do our best to make him feel that he ought to be ashamed of himself. Will Atherson, McCall’s banker and friend of Grant Austen, is advising Austen regarding what to do with his company and tells Austen that he thinks that Cash McCall might be interested in buying the company. Of course, Gil Clark has already brought the possible acquisition of Suffolk Moulding to McCall’s attention. Atherson calls Cash to tell him about Austen’s company and mentions that Austen is meeting his daughter, Lory, at three o’clock in the lobby of the hotel where Cash resides. Lory and Cash had a brief romantic relationship in Maine prior to the events of the novel. Cash and Lory spot each other in the lobby at the hotel—she has no idea that McCall is the person interested in buying the company. Lory and Grant Austen go with McCall to his apartment to discuss the possible sale of Suffolk to McCall. There Lory, an illustrator of children’s books, sees the frontispiece drawing she had done for a novel hanging on his wall. The drawing is clearly a portrait of Cash McCall. Austen makes Cash aware that he and Lory are the sole stockholders in the company and McCall informs Austen that he is the owner of Corporate Associates where Gil Clark had worked and who has been advising Austen on business matters. Cash wants to make certain that Austen is aware of the potential for bias in Clark’s business advice. Cash explains that he had discussed the possible purchase with Clark and that Atherson’s suggestions to Austen of McCall as a potential buyer are just coincidences. Austen states that he is only willing to accept money, not stock, for his company. General Danvers of Andscott was interested in buying Suffolk but he was only able to offer stock in exchange for the company. Austen fails to inform McCall about the possibility of Andscott pulling out its business. Cash offers Austen $2 million and the deal is sealed by a handshake. Lory Austen for years had wanted to be independent of her parents, and the sale proceeds of her ten percent ownership in Suffolk (i.e., $200,000) could at least provide her with financial freedom. In turn, Grant Austen’s wife, Miriam, yearns to be free of her daughter. Possessing an unhealthy jealousy of her daughter, Miriam wants to have Grant all to herself. She resents the late night talks about business in which Lory and Grant frequently engage. Miriam does not know that Lory also dreads their late night talks. Lory wants to travel to Italy to develop her talents as an artist. Miriam views McCall as potential marriage material for Lory. "Cash McCall is a novel by Cameron Hawley that is positive about business and free-market capitalism. It explores many of the same themes as does Ayn Rand’s Atlas Shrugged but it is not nearly as philosophical." McCall calls upon Gil Clark to take over the management of Suffolk during the transition phase and while he searches for a potential buyer for the company. Winston Conway, a highly competent and experienced lawyer, has observed that Cash is a trader whereas Gil is a builder. Gil comes to understand that not many people, not even the employees, realize what companies, and how many companies, McCall owns. For example, McCall owns Lockwood Reports, a firm that collects information on individuals and companies. These reports do not contain information that is illegally obtained—all of its contents are available legally and publicly. Background checks are conducted but an ethical line is drawn so as not to invade the privacy of individuals (e.g., no wiretapping). Lockwood only engages in ethical intelligence gathering. Grant Austen is not the best husband or father, and recently has not done that well in business. He tends to suppress his wife and daughter. He is not able to delegate at work and has been unable to move his company forward. He is loyal to incompetent employees and once he has sold his company, he finds that this loyalty is not reciprocated to him. Austen’s former employees ignore him as soon as he sells the business. Austen views life in terms of a series of win-lose outcomes. After selling his company, he is free to try to mend his family relationships. Unfortunately, the sale of Suffolk leads him to lose his self-direction and self-identity. Austen has always gained his self-worth from his status in society and his membership in the business community. A man of low self-esteem and self-confidence, Austen views and judges himself through the eyes of other people. Unknown to Austen, McCall arranges for someone from Washington to invite Austen to be a member of a committee of U.S. businessmen who would give advice to Latin American companies. Austen becomes a wealthy man liberated from his company but still rather dependent upon others for his sense of worth. Cash McCall is not yet forty. Vibrant and self-assured, he tries to stay anonymous, deals with secrecy, and values his privacy. He keeps his ownership interest in various companies quiet and only divulges his ownership when he believe that someone has the right to know about it. Only Cash’s advisors can contact him. He surrounds himself with high caliber people and has the ability to discern and develop new talent. Cash lives in a penthouse suite (an entire floor) at the top of the Hotel Ivanhoe, and has a direct phone number that bypasses the hotel switchboard. He also has a country retreat home that is surrounded by mountains and that overlooks a waterfall. Having made his first million dollars before he was thirty, McCall flies a remodeled B-26 ex-military bomber. His two residences complement the two sides of his personality. His penthouse symbolizes success and his secluded countryside retreat symbolizes freedom in his personal life. Maude Kennard is the effective, detail-oriented, power-seeking, and ambitious manager of the hotel where McCall resides. At first she views Cash as an irritant to her because of his wealth and ability to obtain whatever he wants. She changes her mind about McCall when she eventually concludes that he owns the hotel. She becomes very interested in him (perhaps even romantically), pursues him, and toward the end of the story, tries to damage him. Cash of course has no interest in her. She even attempts to attain a Lockwood Report to gain information about him. Miriam Austen wants her daughter to spend time with McCall. Lory drives Cash to the airport and he talks her into getting on his private plane. They embark for his private estate where he explains to her that he had fallen in love with her in Maine and that he should not have called off their relationship. He realizes that he made a mistake when he did not pursue her when she showed up at his cabin. He tells her that he has been searching for her ever since. He had thought that he was not ready for a serious relationship. He had always seen himself as being too busy to fall in love. Cash and Lory decide to get married. The jealous Kennard attempts to get revenge when she finds out. Gil begins managing Suffolk Moulding and discovers that Suffolk owns the patents to the machines that produce Andscott’s products. When Cash returns, Gil tells him about the valuable patents that General Danvers needs to run his business. These patents are now McCall’s property. Gil and Cash now realize that because of these essential patents, Danvers needs to continue to do business with Suffolk. Danvers is upset about Cash’s purchasing Suffolk. Danvers is prejudiced against McCall because Cash had sold to Andscott a cabinet plant it had offered to Andscott a year earlier for half the price. McCall is able to capitalize on these patents, an overlooked detail that could have kept Austen from being pressured by Andscott. Even if Danvers had really wanted to pull his business from Suffolk he would not have been able to continue in business. McCall is now in a position to make a significant profit on the purchase and sale of Suffolk Moulding. General Danvers attempts to buy Suffolk for 300,000 shares of Andscott stock valued at $3 million so that he can retain the patents. McCall initiates a plan in which he can potentially gain control of both Suffolk and Andscott. He begins by personally buying another 200,000 shares of Andscott on the market. Andscott gives 300,000 shares of stock to Cash through Cash’s Gammer Corporation. Cash has learned that a medical research foundation established by Horace Andrews has a large block of Andscott stock. The foundation depends upon Andscott dividends for funding its research projects and no dividends have been paid for the last four years. Cash wants to add the foundation’s proxy to the half million shares of Andscott that he has acquired, thus giving him ownership control over Andscott and Suffolk. Gil sets up a meeting with Dr. Martin Bergmann, head of the research foundation. Gil finds out that Bergmann supports Cash and wants him to take a strong interest in the management of Andscott. Bergmann needs Andscott dividends and he believes that Andscott desperately needs a new President. Ultimately, Cash finds a President for Andscott but keeps Danvers as Chairman of the Board. Despite their previous run-ins, Cash, ever the professional, recognizes Danvers’s talents and offers him that important position. McCall also sends Gil to Andscott for a new career as Vice President of Research and Development. Trouble begins to brew when Harvey Bannon, President of Cavalier Chemical Company and a member of Andscott’s board, divulges to Grant Austen that Andscott is giving 300,000 shares of stock worth approximately $3 million to Cash (through Cash’s Gammer Corporation) for Suffolk. Austen is furious because he thinks that McCall has duped him and made a fool of him by turning right around to sell Suffolk to Andscott at a $1-million profit. On top of this, Maude Kennard discovers that Cash did not own the Hotel Ivanhoe and that he planned on bringing a woman into his life and it was not her. The jealous Kennard had also overheard details of McCall’s business deal with Andscott. She attempts to gain revenge by unprofessionally telling Austen that he is being taken advantage of by Cash. Kennard also discusses what she overheard about Cash’s business deal with lawyer Clay B. Torrant. The infuriated Austen seriously considers a lawsuit against McCall. He suspects that Gil Clark, Harrison Glenn, Will Atherson, Winston Conway, and others are all part of the “McCall gang” and conspired against him. Austen appears to forget that he had wanted cash rather than stock. What had actually occurred was the result of a number of remarkable coincidences involving the above individuals—there was no conspiracy. The parties involved all agree that they would be willing to give Austen back his company if that was what he wanted. Cash and the rest of the “McCall gang” are willing to reverse the sale. Cash goes to see Austen to see if he can clear up matters. Lory reminds her father that Cash has been upfront from the beginning and told him that he owned Gil’s company. During the conversation between the Austens, Lori, and Cash, all of the evidence is presented and explained and the air is cleared. Austen then understands what really transpired. Austen realizes that it was he who had not been forthcoming when he withheld information about the potential loss of a major customer. He also remembers how happy he had been with the price he received, how Cash had suggested that he receive legal counsel, and how Cash had asked him if he was certain he wanted to go through with the deal. In the end, Cash is shown to be an ethical financial maverick, and he finds the romantic relationship he had been lacking.